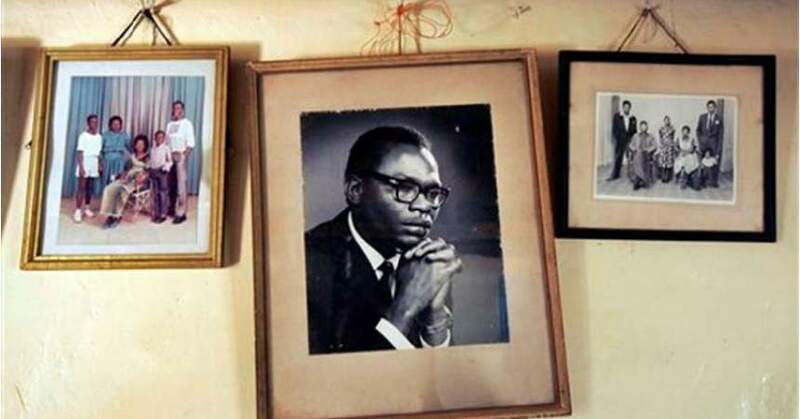 In this Thursday, Feb. 5, 2008 file photo, a photograph of Barack Obama Sr., father of President Barack Obama, hangs on the wall of his step-grandmother Sarah Obama’s house in the village of Kogelo, near the shores of Lake Victoria, in Kenya. On Friday, July 24, 2015 Obama was due to arrive in Kenya, the country of his father’s birth, for the first time since he was a U.S. senator in 2006, and the first stop on his two-nation African tour in which he will also visit Ethiopia. When Barack Obama visited Kenya for the first time nearly 30 years ago, he was astonished that an airport worker recognized his last name. 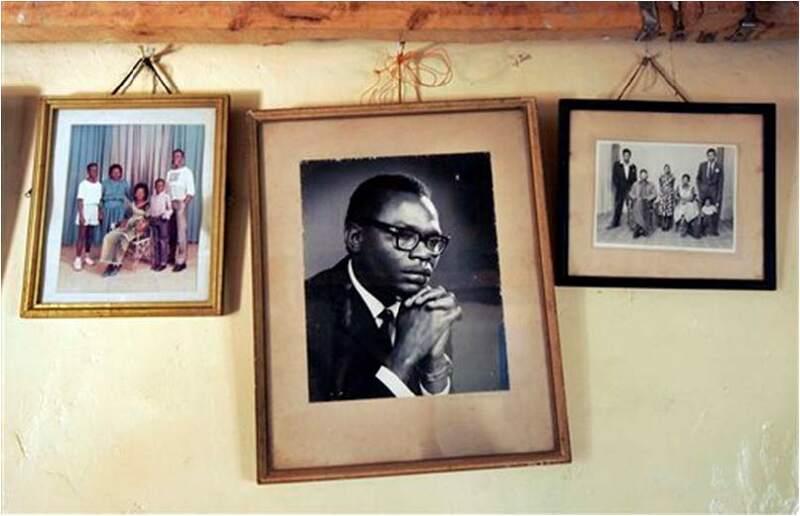 It was a striking experience for a young man — and future American president — struggling to understand how a country he had never seen and a Kenyan family he barely knew had shaped his identity. “My name belonged and so I belonged, drawn into a web of relationships, alliances, and grudges I did not yet understand,” Obama wrote in his memoir, “Dreams From My Father,” about the airport encounter. Last week, Obama visited Kenya as U.S. president, a trip that will bear little resemblance to the 1988 one, when he arrived aboard commercial flight and his luggage was lost. Now, Air Force One will take Obama to a country where children, roads and schools now bear his name, and the world leader is seen as a local son. Yet traveling with the trappings of the presidency appears likely to diminish the fulfillment of a trip to his father’s homeland. Security concerns and the logistics of presidential travel will keep Obama at a distance from most Kenyans. He will skip a visit to Kogelo, the rural village in western Kenya where his father was born and buried, and where his stepgrandmother and other family members still live. Obama’s two days of events are scheduled to be confined to Nairobi, the capital where he will meet with Kenyan President Uhuru Kenyatta, attend the Global Entrepreneurship Summit, and speak to civil society leaders. On Sunday, he will go to Ethiopia. Despite the limits on Obama’s movement and interactions with the Kenyan people, his visit is highly anticipated in the East African nation. Even as a U.S. senator, he was greeted by cheering crowds when he made his last visit to Kenya, in 2006. Ahead of Obama’s arrival Friday, some Kenyans have adopted a rousing segment of an Obama speech as their cellphone ringtone. U.S. and Kenyan flags lined the road leading from Nairobi’s main airport. Obama’s visit is like “a brother coming back,” said Nelly Ngugu, customer relations manager at a Nairobi cafe. Before Obama’s travel plans were announced, there had been some disappointment that the U.S. president who has written and spoken emotionally of his Kenyan roots had not returned since taking office. Analysts questioned whether America’s first Black president was missing an opportunity to give Africa more prominence in U.S. foreign policy. Much of Obama’s international focus in his first term was on strengthening ties with Asia and trying to reset U.S. policy in the Middle East. His only visit to sub-Saharan Africa during his first four years in office was a short stop in Ghana. At the time, there was persistent and inaccurate speculation that he was born in Kenya, not the United States. Some political opponents tried to use the rumors to undercut Obama’s eligibility for president. As late as 2011, a CBS/New York Times poll showed that one-quarter of all Americans believed Obama was not born in the U.S.
Obama’s re-election raised renewed hopes for a visit to Kenya, but the political situation there complicated those plans. Kenyatta, the son of the country’s first president, was elected president in 2013, but faced charges in the International Criminal Court stemming from his alleged role in stoking ethnic violence following Kenya’s troubled 2007 election. “The timing was not right for me as the president of the United States to be visiting Kenya when those issues are still being worked on and, hopefully, at some point resolved,” Obama said of his decision to pass over Kenya in favor of South Africa, Tanzania and Senegal during a 2013 trip to Africa. The charges against Kenyatta were ultimately dropped, clearing the way for Obama to finally visit his father’s home country as president. With his arrival now imminent, the earlier disappointment appears to have faded, overtaken by anticipation and national pride. In Kogelo, the Obama family’s home village, the family’s aging matriarch said even she would not feel bad if the president did not visit her. Sarah Obama, who Obama referred to as “Granny” in his memoir, said the president was coming to Kenya “to discharge his duty. Article courtesy of the Black Press USA.